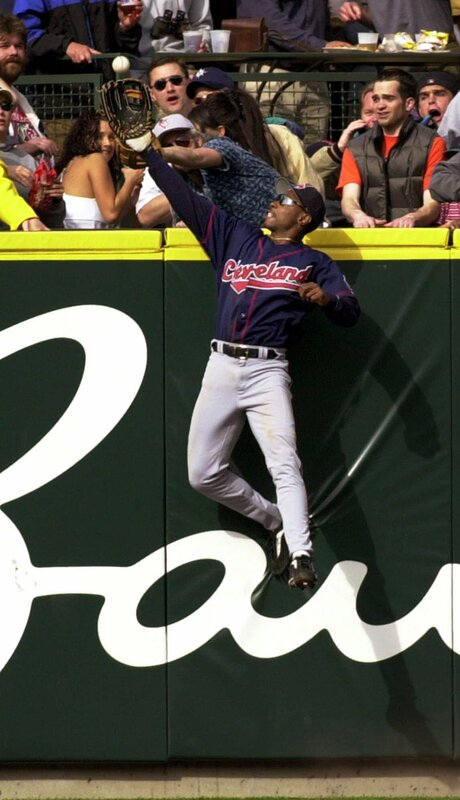 Kenny Lofton showing off some of the skills that earned him four Gold Glove Awards. Kenny Lofton enjoyed a successful 17-year Major League career with 11 different organizations. Of course, he is best known as a member of the Cleveland Indians, a team he spent parts of 10 seasons with on four different occasions (1992-1995, 1996, 1998-2001, 2007). His speed and grace helped earn him four Gold Glove Awards and the .299 career hitter was a member of six All-Star teams. Our Jim Monaghan recently sat down with Lofton to talk about his career in baseball, the World Series, and life after baseball in the film industry. JM: Just a terrific Major League baseball career that you had Kenny. 17 seasons in the Major Leagues; in the postseason 11 times; in the World Series twice; an Indians Hall of Famer. You had quite the career. KL: Yeah, it was fun. I had a great time. I mean I enjoyed every minute and the experiences I had with different teams that I played for. And my 2 greatest moments were the World Series (’95 w/Indians, ’02 w/Giants) I played in. They were pretty fun. JM: The team I associate you most with, of the 11 you played with, is of course the Cleveland Indians. And you played with them for one good chunk of time and then came back with them a few other times. The KC Royals this year, Kenny, remind me an awful lot of that Cleveland Indians team in 1990s. That team you played on, the Indians team, you played on in the 1990s. That Indians team you played on was just so much fun to watch. And the Royals team really recaptured that spirit for me in this postseason. Guys like Lorenzo Cain and Nori Aoki. KL: Well you know I think we had a combination of pretty much everything. We had speed, defense, we had power…we had it all. We didn’t have the best starters in the world, but we had a team that was very steady, you know we got the job done. We all worked together, and had a great bullpen. We had an all-around great team, but I think our speed and defense stood out and that’s what’s going on with Kansas City. Their speed and defense is standing out right now. When you get in the playoffs, you get on a roll and that’s what Kansas City has done, has gotten on a roll and they have not stopped. JM: Yeah, sometimes it’s not the best team that wins (the World Series), it’s the team that’s the hottest. And that may be what this San Francisco team is walking into, because this Kansas City Royals team has been incredible. KL: Oh yeah, they’re (the Giants) in trouble. They (the Royals) have this attitude. They’re very confident in what they’re doing, and what it means for them to play defense and when they get on base they use their speed. There’s no team in baseball that SF has faced this year like this. There’s going to be a rude awakening for them once the process all starts. JM: Safe to say Kenny that you’re picking Kansas City in this World Series? KL: I like Kansas City because of that reason. That was my style of play. They’re doing what I liked to do. And baseball had gotten away from all of that because of the steroids and all that. But baseball is back to the way it’s supposed to be. Fun, speed, defense…so you know that’s the reason I’m liking them, because they play my style of game. JM: You played with a very controversial player in your career, Albert Belle. I actually know somebody who roomed with Albert when he was coming up in the Cleveland system early in his career. He said that Belle was completely misunderstood. Do you think that’s going to keep Albert out of the Hall of Fame? His numbers on the field is what depicts what goes on. What you do a little bit off the field should kind of weigh a little bit, but his numbers are above and beyond anybody I have ever seen ever. So if you’re going to look at it, Pete Rose belongs in the Hall of Fame. But I don’t think, again, with Albert, you can’t look at how someone’s attitude, or what it’s like. Look at Eddie Murray. People complained about Eddie Murray, and he was a first ballot Hall of Famer. So it’s about the numbers. It’s about what you put up in the game. So that’s what the people should look at, not all that other stuff. JM: You just mentioned about a team getting hot at the right time. We’re at the 10-year anniversary of that 2004 Red Sox team that came back from three games down against the Yankees. You were on that Yankees team. As you were watched those four games unfold after that 19-8 clobbering, what was going through your mind and the mind of your teammates at that point? Could you really believing what was happening as that Red Sox team got hot? KL: Well I was on the bench. So I felt like I was a guy that should have been on the field and wasn’t. So I was sitting on the bench and it was tough to where I know what it’s like to play in those situations and I felt I should be in the game and I wasn’t. But you could saw it coming and unfolding, and nothing. And the tough part about the whole thing, I was upset, because there was nothing I could do about it. I wasn’t in the game. That’s what kind of made me feel like I know what I can do and what I could bring to the table. Just watching it unfold and you got your hands are tied and couldn’t do anything about it. Actually, it was a sad feeling for me to sit there and watch it. JM: Kenny, last week I spoke with Dean Cain (TV’s Lois and Clark) last week about this new movie he’s working on, “My Last Christmas”. There’s an indie funding project that’s tied in with it. What’s your role with this film, with Dean? KL: I’m good friends with Dean. I brought the project to him from a guy who works with me. I’ve got a company called, “Film Pool” that I’ve had since 2004. The guy that works with me brought the project and said, what do you think of the project? I liked it and took it to Dean and a few other people. It’s a project that I’m very passionate about. You go to indiegogo.com/mylastchristmas and it was a film about a form of a cancer, Myelodysplastic Syndrome (MDS), that a lot of people don’t know about. It’s very rare and if you’re multi-racial there’s a good chance you could come up with this cancer. We hooked up with a company called “Project Race”. They’re a company that goes out and tries to get people to register for bone marrow (to donate.) Because you need this type of bone marrow… you’ll need to find a match. We felt very strongly about it. I talked to Dean he was very passionate about it and he liked it, because family members and friends he knows as well, besides me, that are multi-racial. If something was ever to happen and you can’t find that match you’ll feel very sad. When you have that opportunity to go out there and make awareness to this form of cancer and that’s what this film is all about. JM: And your college degree was actually in film studio production, right, at University of Arizona? And what is the website again for the film. KL: Yes it was and I had an opportunity to start up my company in 2004 and this is where I am right now. The website is My Last Christmas and you can also go check it out on Twitter. JM: Best of luck to you and Dean on this film. Thanks Kenny, and continued success to you. KL: All right, thanks a lot! Jim Monaghan can be heard Monday through Friday mornings on the WDHA Morning Jolt from 6-10AM & Sundays from 7-10AM with “All Mixed Up.” He’s also an instructor at Professional Baseball Instruction in Upper Saddle River. Follow him on twitter – @Monaghan21. Three Cy Young winners All in a row. It’s been a five days since the craziness of the final hours of the Major League Baseball trade deadline came to an end. I cannot recall the last time there was such monumental team changing/game changing deals on July 31. Lately, many of the bigger trades have taken place as the deadline neared. This year, it was a frenzy right down to the final minutes, with some deals announced shortly after the deadline had passed. So, who came up as the winners and losers at the deadline? Let’s take a look. Oakland A’s: This isn’t Moneyball, this is sending and receiving at its finest. The A’s needed to strengthen their starting rotation and add some veteran presence to it. Prior to the deadline, they went out and got Chicago Cubs ace Jeff Samarzdija and fellow starter Jason Hammel for a package that included highly rated shortstop prospect Addison Russell. Detroit Tigers: Justin Verlander, Max Scherzer, Anibal Sanchez, Rick Porcello, Drew Smyly. That’s a pretty intimidating starting rotation right out of the box. Now add David Price to it and look out. That’s exactly what Tigers’ GM Dave Dombrowski was able to do on Thursday. As soon as Lester was dealt by Boston, Tampa Bay Rays’ Executive VP of Operations and GM, Andrew Friedman, began to get inundated with calls about Price. The 2012 AL Cy Young winner still had another year on his contract, so Tampa did not need to trade him this year with the worry of losing him to free agency in the offseason. But Friedman found a deal he liked and brought in the Seattle Mariners as a third team to get it done. The Rays sent Price to Detroit, who in turn traded centerfielder Austin Jackson to the Mariners and Smyly and minor league infielder Willy Adames to the Rays. The Rays also received second base prospect Nick Franklin from Seattle. 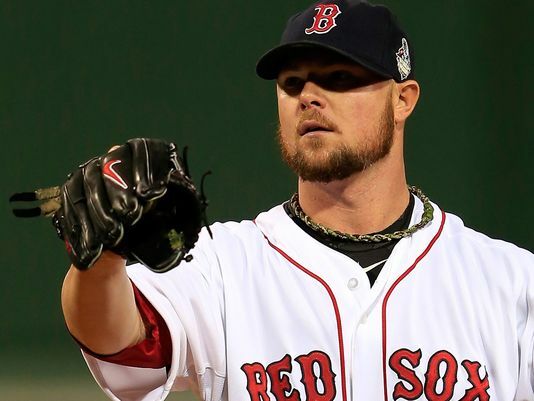 Boston Red Sox: There were a lot of disgruntled Red Sox fans on Thursday, most of them not wanting to see Lester go. But with a better than 50/50 chance of Lester returning as a free agent, GM Ben Cherington took a team that went from first to worst and got it back on the road to future success. Craig drove in 90-plus runs the last two seasons before an ankle injury robbed him of much of the current season. He’ll give depth to a lineup that has struggled to score runs this season. The Red Sox also added youth with the just turned 30-year old Craig and the 26-year old Kelly. The right-hander was solid the past two seasons as a reliever and occasional starter, and helped the Cardinals to their second NL pennant in three years in 2013. The Sox also dealt veteran shortstop Stephen Drew, to the Yankees of all people, to free up playing time for Xander Bogaerts, Will Middlebrooks, and Mookie Betts. The aforementioned Peavy deal brought them pitcher Edwin Escobar, ranked in the 2014 top 100 MLB prospects by Baseball America and MLB.com, and a possible addition to their bullpen in right-hander Heath Hembree. Philadelphia Phillies: One has to wonder how GM Ruben Amaro Jr. has managed to keep his job. Yes, the Phillies won the World Series in 2008 and repeated as NL pennant winners a year later. But the writing was on the wall for quite some time and Amaro ignored it. He also doled out way too much money for too many players and was unable to move any of them by the deadline. One of those players was starting pitcher Cliff Lee. The former AL Cy Young Winner still has about $37.5MM owed to him for the next two years. Whether he’ll be able to play or not is another matter. Lee was bothered by elbow problems this season, which made him and his contract harder to move. But Amaro should have done something, even if it meant not getting much in return. He may have been able to move some of Lee’s salary. He didn’t and Lee re-injured his elbow and is likely done for the season, which means no waiver trade either. First baseman Ryan Howard is not what he used to be, which was a home run smashing, RBI-producing, bad-fielding first baseman. Okay, he is still the last part. Amaro foolishly gave Howard a six year, $106MM extension after the 2012 season. It’s a deal that will be paying Howard $25MM the next two years when he is 35 and 36. The Phillies are just lucky, if you want to call it that, they have a $10MM buyout on a $23MM option in 2017. If you are to believe the reports, Amaro was also asking for too much in return for outfielder Marlon Byrd. As of this writing, the 36-year old had a .799 OPS with 21 HR and 63 RBI in 110 games. Ah, but Amaro’s over-generosity did him in again. There are plenty of teams that want Byrd for this year, maybe even next season at the $8MM it may cost them. But they don’t want a 38-year old Byrd with another $8MM in 2016. Amaro was clearly counting on Byrd not being able to attain the vested portion of his contract – 600 plate appearances (PA) in 2015 or 1100 PA between this year and next. Byrd already has 462 PA as of this writing, with nearly two full months of the season left. Amaro could have also moved A.J. Burnett, whose performance has dropped off from last season. Burnett makes $15MM and has a mutual option with just a $1MM buyout for next year. In today’s market, Amaro did a good job on Burnett’s deal. Burnett is the most likely of the Phillies to pass through waivers and be dealt. He’d better be or Amaro’s trade season will be a complete flop. Not that it still won’t be a complete flop even if Amaro does move Burnett. There were a number of teams that hoped to improve with minor moves that fall somewhere in between winner and loser. Time will tell which of the categories those deals fall into. Scott Kazmir has been down a road many baseball players have taken: A road with no exit. At some point, every player’s career comes to an end. Regardless of age or how good you may think you are, the powers that be can make it all go away. A few short years ago, Scott Kazmir was at a crossroads in his career. Injuries, control problems, and a lack of confidence haunted him. Whatever the cause, his career was all but over. Until 2013, Kazmir’s last appearance at the Major League level came with the Los Angeles Angels of Anaheim in 2011. He appeared in one game, surrendered five runs and was promptly released. His future was then in limbo, and the once promising career of this first-round draft pick was uncertain. Zambrano recorded eight wins over the next three seasons, while Kazmir became the ace of a young Rays staff. Six years in Tampa saw Kazmir develop into one of the best left-handers the game had seen in quite some time. Despite a small frame (6’0, 185), he was blessed with an arm that could light up the radar gun in the mid 90’s. Midway through the 2010 season, his fastball was clocked at a touch over 90 mph (90.5). It was the first time in his career that his fastball averaged under 91 mph. It was his first full season with the Los Angeles Angels, and his armor had begun to show cracks. A combination of injuries and poor pitch selection were contributing factors to what became the worst three-year stretch of his career. The signs were always there. From 2009 until 2011, his velocity2 dropped nearly five mph, and he was relying on his fastball more than ever. Batters were connecting with his pitches in the strike zone at abnormally high rates (94.7 percent in 2011), and hitters weren’t missing pitches in the strike zone (3.2% in 2011). When Kazmir was released, it looked like he was done at the ripe old age of 27, but Kazmir wasn’t ready to throw int he towel. Despite getting pounded start after start, Kazmir battled each time he took the mound. After his release, he regrouped and started anew with the first-year independent, Sugar Land Skeeters. “The Sugar Land Skeeters took a flyer on Kazmir this past year and despite some rough patches that included a nine walk performance against the Southern Maryland Blue Crabs, he regained the form that once made him an All-Star, leading to people around the game to again take notice. In 14 games with the Skeeters, he put together a 3-6 record with a 5.34 ERA with 51 strikeouts in 64 innings. Walks -his Achilles’ heel – were under control for the second half of his Skeeters season, allowing three walks or less in five of his six final starts. The Cleveland Indians took a chance by signing him to a minor league contract. It paid off for the Indians, who made it to the post-season and for Kazmir, who proved all the critics wrong. His numbers didn’t represent anything earth-shattering; 10-9, 4.04 ERA, 158 innings, 167 strikeouts, 47 walks, 1.323 WHIP, 9.2 SO/9. Although, they were very similar to his 2008 All-Star year with the Rays, and considering where he was just a few months prior, last season can be considered the best of his career. 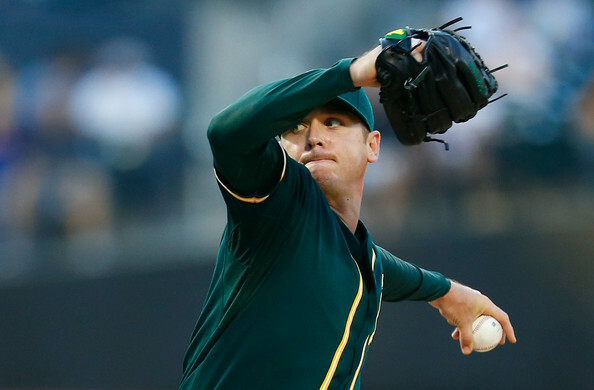 The rejuvenated Kazmir was granted Free Agency by the Indians, and he promptly signed4 a two-year deal worth $22 million with the Oakland Athletics. In less than half a year with the AL West-leading Athletics, Kazmir has been one of the best pitchers in the game. In 16 starts5, he’s tied for fourth in the AL with 9 wins, and his 2.66 ERA is good for fifth. He’s been so good, even though he surrendered seven runs to the New York Mets in his last start, he still sits in the top five of the following categories: WHIP (1.01), Average Allowed (.217), Winning Percentage (.750) and Hits Per Nine Innings (7.16). When you talk feel-good stories, the Kazmir transformation from independent cast-off to top lefty in the game is remarkable. Legendary even. There has never been, in my memory, anyone else that has gone from the top of the baseball world to the bottom and again back to the top of the mountain so quickly. Once cast side, Scott Kazmir has become a sought-after commodity again. Devon is the Founder and Executive Director of The GM’s Perspective and a contributor at Designated For Assignment. He is a former professional baseball player with the River City Rascals & Gateway Grizzlies. Currently, Devon is a Manager at a financial institution in Northern Ontario Canada, and can be reached at devon@thegmsperspective.com. You can follow The GM’s Perspective on twitter and facebook. His full bio can be seen here. 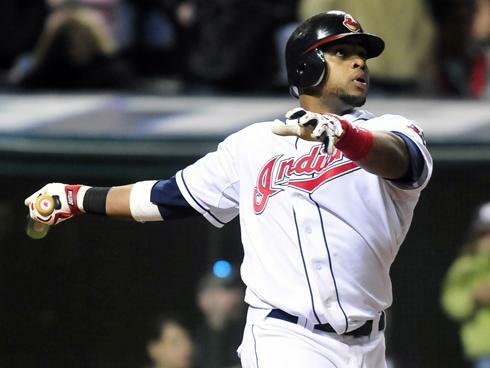 Carlos Santana looks to make a smooth transition to third base. 2013 was a year of improvement for the Cleveland Indians. Although they didn’t make it far into the post-season, they took a huge step in the right direction by qualifying for the playoffs for the first time since 2007. In their first year under new manager Terry Francona, the Indians went 92-70, a 24-win improvement from the 2012 season. This impressive turnaround can largely be accredited to the Indian’s pitching. However, with the departures of Scott Kazmir, Joe Smith, and Chris Perez, the Indians had quite a bit of work to do this offseason. 1 Unfortunately, it appears, at least on paper, that they didn’t do enough. Currently, the team has a four-man rotation of Zach McAllister, Corey Kluber, Danny Salazar, and Justin Masterson. Only one of the four pitchers, Justin Masterson, has spent a full year in the majors. It would’ve been smart for Cleveland’s general manager Chris Antonetti to acquire a big-name pitcher via a trade or free agency to help continue the team’s success. That hasn’t been the case, though. The Indians acquired John Axford to replace departed closer Chris Perez, but Axford is likely not going to be the impact player that the team needs. Although there is still time left in the offseason, the days are winding down for Antonetti to make a major move. If a veteran pitcher isn’t signed, the team could rely on prospect Trevor Bauer or allow newly acquired Sean Marcum a chance at making the rotation. Bauer is still going through growing pains and Marcum has suffered a number of injuries the last few years that have derailed his career. The Indians do still have a solid offense thanks to players like Carlos Santana, Michael Brantley, Nick Swisher, and Jason Kipnis. Swisher and Santana are expected to be the main sources of power after slugging 22 and 20 home runs, respectively, last season.2 In a move to preserve his body and his offensive output, Santana has primarily played third base during Spring Training and could beat out one-time prospect Lonnie Chisenhall for the job. He’ll also give Swisher a rest at first base now and then. Brantley, arguably, had the best season of his career. He set new highs for home runs (10), RBI (73), stolen bases (17) and runs scored (66). Fancona is counting on Brantley to continue developing his power. Kipnis built off his 2012 season with a 100 point jump in OPS and led the team with 84 RBI and 160 hits. He and center fielder also disrupt the opposition with their speed. Kipnis stole 30 bases in 37 attempts, while Bourn, despite an off-year, nabbed 23 bases. Bourne has topped the 60-stolen base mark twice in his career. The Tribe signed free agent David Murphy away from Texas to add a solid left-handed bat to the order. Though his OPS dipped under .700 in 2013, Murphy’s career mark of .778 will be a boost to the lineup against right-handed pitchers. Francona will also use Ryan Rabun in the corner outfield positions and second base to add more punch to the starting nine. Jason Giambi should see a good amount of time as the DH against right-handers once the rib he broke in Spring Training heals. The Indians also seem to have some hope for the distant future with prospects like Francisco Lindor and Clint Frazier. Frazier, an outfielder taken fifth overall by the Indians in last year’s amateur draft, is known to have raw power at the plate. He slugged an impressive .510 in rookie ball last year and had 21 extra base hits in 44 games. Though a long way off from playing in the big leagues, the 18-year old’s promise gives Indians fans something to look forward to. With shortsop Asdrubal Cabrera in the final year of his contract, Lindor could make a push for the starting job next season with a stellar year in the minors. Ranked the 13th best prospect in baseball by Baseball America, the 20-year old has a reputation as a solid hitter and base stealer Last year with the Carolina Mudcats, Lindor hit .306, slugged .410, and swiped 20 bases.3 His defense will determine how quickly he arrives in the Major Leagues. Although this extra offense is good for the Indians, it’s not what they need the most right now. Unfortunately, neither of these top prospects are pitchers that could solve Cleveland’s pitching troubles this year. If the team is looking to have a season similar to 2013, something must be done about their lack of experience in the starting rotation. In 2014, the Tribe needs to prove that last season wasn’t just a fluke and that they’re back to compete.